Recently I visited the exhibition You can’t please them all – a retrospective of modern Indian painter Bhupen Khakhar (1934-2003) at Tate Modern, London. The show, curated by Chris Dercon, former Tate Modern director, and Nada Raza (research curator), opened on June 1 2016 in London and will travel to the Deutsche Bank Kunsthalle in Berlin in November 2016. I came to know about the show due to reviews that circulated via social media prior to the opening, and which caused a serious controversy and protest against neo-colonial attitudes towards a still imagined ‘non-European other’ by art experts in India and Great Britan. With this post, I wish to provide some anthropological observations on the controversy which demonstrates a crucial claim for equality in the international art world. The exhibition, a joint venture between Tate Modern, Deutsche Bank and the Khiran Nadar Museum in Delhi, is the first international retrospective about Bhupen Khakhar. I came to Tate Modern just to to see the show, and when I entered the exhibition space, I was immediately attracted by the apparently naïve paintings in powerful colours, depicting ordinary men, animals and street scenes in India. I was deeply captured by the impressive and straight illustrations of partly provocative and intimate scenes with male nudes, homosexual couples, but also the artist’s engagement with his own serious disease and medical treatments. Displayed in five rooms, paintings of different scales and styles that ranged from collage to oil painting, were arranged according to specific themes and different creation periods of the artist (see an online room guide here). In the largest room, central to the entire space, glasscabinets with personal writings such as diaries, letters or newspaper articles informed about the artist’s life and thinking, whilest a film portrait about the painter was shown in another room. 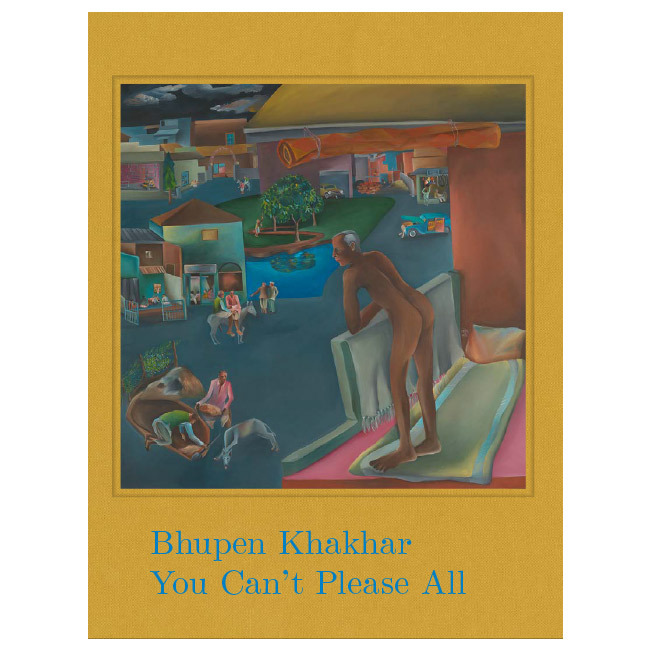 Bhupen Khakar, a famous modern painter in India and who died from cancer in 2003, was until now an unfamiliar figure to me. However, conducting research as an Anthropologist about India and visual cultures (including contemporary art, photography, or street art) for more than 15 years, Khakhar’s artistic body of work touched me in an unexpected intense way. Wandering around in the exhibition space, I became fascinated by the power of Khakar’s figurative style and the multiple details that guides the viewer’s eye, almost like a mind-map, into the deep dimensions of India’s popular culture and the artist’s personal world view. One meaningful example is certainly the self-portrait entitled ‘You can’t please them all’ (1981, oil on canvas, 175,6 x 175,6 cm) in which Khakhar positions himself as naked man, and who stands on the balcony watching the street scenery of a Indian town in front of him. Interwoven into the urban landscape, the artist depicts in several smaller scenes the ancient fable ‘You can’t please them all’ about a father, a son and a donkey. Interesting here is not only that Khakhar transfers this narration into an Indian context, but more importantly, that he employs the story’s moral for performing his ‘coming out’, revealing his homosexuality to a society which might have not been pleased about it. The complexity of the artistic representational gesture as represented in Khakhar’s oeuvre, makes this retrospective at Tate Modern an extraordinary example for understanding art in its cultural function as it represents entangled histories of an individual, his artistic practices and his very specific interpretation of India’s society at that time. In this regard, the controversy that was sparked by a critical review about the exhibition and which took place in the media early summer 2016 brings even more attention to the significance of public debates about contested meaning production in reference to international art exhibitions. This particular controversy which I want to introduce here, was triggered by Guardian writer and art critic Johnathan Jones’ review with the title Bhupen Khakhar review – Mumbai’s answer to Beryl Cook, that was published by the Guardian a day before the exhibition opened. As problematic as it was, Jones’ comments were revealing, because they allowed to understand existing asymmetries represented by mutual perceptions of agents within the international art world. What makes this an odd exhibition for Tate Modern to put on is that Khakhar so strongly resembles the kind of British painter it would never let through its doors (ibid.). Promoting an unambiguous neo-colonial attitude in here, and as it was perceived from wide parts of Indian art experts, Jones approaches Bhupen Khakhar as by comparing him as the Mumbai’s answer to British female artist Beryl Cook. It is without saying that these kinds of comparisons which are quite popular when it comes to formulate interpretation of artists who originate from countries outside the Euro-American sphere, and carry a strong flavour of Westernized centralism. In the specific case of the artist Bhupen Khakhar it proves once again how such a perspective can easily be employed to wipe away an artistic oeuvre and charismatic personality of an artist whose socio-political and personal way to see and depict the world was so influential for many in the local Indian art world, and beyond. Following Geeta Kapur’s example many others responded to Jones’ review, who, unfortunately, never publicly replied towards the critiques he had provoked. With this brief description, I hope that I provided some idea about the incident and nature of discussion it provoked (for further information many of the written reactions are accessible on the internet). My concern here is rather a different one: When I engage with the various perspectives of this controversy, the situation sheds light on a heavily contested field of cultural meaning production, that politics of representation create at museum sites and within the contemporary art world. And even though it seems that the controversy discloses still existing ‘trench warfares’ of biased, asymmetrical relationships in which one party claims the right to judge about and reinvent an ‘other’, the nature of argumentation is by far much more far-reaching. It demonstrates a significant situation in a shared, yet translocal, art world, in which dissonances between members at different parts are at work and that prevent them from conceiving themselves on equal level. Working as an anthropologist in the wider scope of visual and media cultures, I have a particular interest in the field of art and the ways in which exhibitions and artistic work are created as sites where knowledge and cultural identification are contested. When I conducted a long-term ethnographic study (2009-2014) about the travelling exhibition Indian Highway that showcased Indian contemporary art in Europe and China and which had been initiated by leading curators from the Serpentine Gallery (London) and the Astrup Fearnley Museum of Modern Art (Oslo), similar issues were of central interest. Doing empirical research on its shifting exhibition venues, curatorial features as well as artists’ positions, I investigated the politics of representation and the question of how curators and artists employ art, and the exhibition, as a platform for negotiating manifold positions of the ‘self’ versus the ‘other’. Much has been written about the idea of exhibiting cultures as ‘exotic’ and as something ‘desirable’, particularly in the late 20th century and with some critical eye on western art- and ethnographic exhibition making. With the argument for a transcultural complexity of cultural identification processes, originating from those historically established attributions, helps to approach such entanglements between agents in different socio-cultural scopes as ongoing processes of transformation. Particularly those entanglements that illustrate conflictual position-taking, allowed me to study the multiplicity of cultural production that the contemporary art world constitutes, and which bases in some important manner on existing dissonances between different perceptions and representations of the ‘self’ versus ‘the other’. Acknowledging paradigms such as mobility, institutional networks, and curatorial and artistic interventions as incisive in today’s globalized world, the dynamics of transformation between the so-called ‘West’ and ‘non-Western’ have to be considered as central, just in order to understand activities of overcoming the same. In this sense, academic and intellectual debates about the cultural meaning of art as well as public controversies between participating agents, between curators, artists, and art critics, proof their significance when we want to understand how art contributes to cultural systems in a world that constantly crosses and intervenes cultural, socio-political and geographical borders. Pinpointing museums and exhibitions as crucial sites where critical engagement takes place, the controversy about the Bhupen Khakhar exhibition illustrates a powerful case, not only for the circulation of art and the related meaning production, but most strikingly for what the contemporary art world is conceived as, namely as a field in which agents meet on ‘eye-level’. Thus, instead of asking in an old-fashioned manner ‘Who has the right to judge an Indian painter and his retrospective curated at the Tate Modern in London?’, I suggest we should pay attention to still existing power-relations by questioning ‘What does such a controversy tell about a globalized art world, in which participants from all over the world claim for egalitarianism (not to be confused with homogeneity)?’. What we learn (anew) is the influential power of exhibitions to generate interpretation of cultures and a dissemination of a particular knowledge which cannot be taken as granted. That the production of knowledge as it is mediated by art, exhibitions, but also by art writing, generates challenges and responsibilities for everybody in the field, has been convincingly demonstrated when members of the art world openly formulate their critique. Returning to the exhibition of the Bhupen Khakhar retrospective where I spend quite some time in this thoughtful display and which made this an enriching experience of Indian modern art. The exhibition which was accompanied by a catalogue with a collection of texts by artist-friends and peers, as well as by an exciting program of public events including a symposium Showing, Telling, Seeing: Exhibiting South Asia in Britain 1900 to Now, might have not pleased all, but was in this sense, even more of a success.